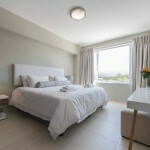 Welcome to this one bedroom one bathroom self catering apartment situated in Green Point and just a stone throw away from the Green Point Stadium. Doric has a front-facing view over Green Point Main road. Greenpoint has amazing restaurants, coffee shops. Not far from spectacular beaches & the V&A Waterfront. The complex offers secure parking.